Posted on Mon, Apr 2, 2012 : 11:55 a.m. I was recently honored and thrilled to be one of the judges at the third annual Brisket Bake-Off hosted by the Sisterhood of Temple Beth Emeth. It was a fabulous time, filled with excellent food and wonderful friends both old and new. To read about the adventure, go to my blog — Food Floozie — today for all the details. Unfortunately, Miriam's brisket — from a recipe she'd found in Cooking Light — didn't win one of the prizes. People were surprised, as so many were asking about it, seeking it out at the buffet table (which offered guests an opportunity to enjoy the competitors' briskets), and raving about it. As a judge, I had no answers — I'd enjoyed everything I ate, and told her point-blank that I'd loved her entry as well. The brisket met four of the five judging criteria — aroma, appearance, texture, and taste — with no question, receiving high marks for each. So my best guess is that, perhaps, Miriam's might not have scored well on the all-important "Jewish Factor," a critical fifth aspect. 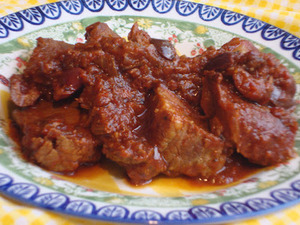 Brisket is a classic Ashkenazi dish, served by Jews of Eastern European heritage. This dish, then, with its olives and tomatoes, did not fit that image. However, Sephardic Jews — descended from those who were expelled during the Spanish Inquisition, who migrated to the Middle East and Africa and beyond — would absolutely use these ingredients in their cooking. Did this particular brisket, then, warrant lesser marks for not being traditionally "Jewish" or higher marks for representing both groups? This brisket is great on its own, chopped and served over pasta with a generous helping of sauce, or used as a filling for a sandwich... it's an easy, flavorful dish with excellent flavor! Sprinkle the brisket on all sides with the salt and pepper. Heat the oil in a Dutch oven and brown the brisket on all sides over medium heat. Remove the brisket and add onion and oregano to the pan; saute for 3 minutes. Return the brisket to the pan and add the water. Cover and reduce heat; simmer for 2 hours. Add the olives and tomatoes; cover and cook for 1 hour. Remove the brisket and let it stand for 5 minutes. Cut brisket against the grain into thin slices, then return the brisket to the pan. Cover and continue to cook for 30 minutes. Serve the brisket with the sauce. Sat, Apr 7, 2012 : 2:10 p.m. This sounds amazing! Can't wait to try it. It would have been good for Passover last night! Sat, Apr 7, 2012 : 3:42 p.m.